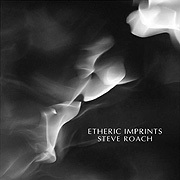 Etheric Imprints (73'54") may first feel like mere weightless flight within a mesmerizing drone. But, if used to fill the many cold hours before dawn, it reveals much. Our most reliable spark in the dark, Steve Roach opens this album with the unknown wants of mild dissonance. Along with his well-warmed synthesizers and affective atmosphere Roach introduces cavernous sized piano notes. Uttering the undertone of this work this acoustic component opens Etheric Imprints into a constant twilight at the edge of forgetting. A spider webbing of force beams sets and gets the tone just right - and as sound pours around the listener this cool music smolders just a bit. Passing through the night, diffuse sounds rise against a much larger backdrop. Twinning and twisting, the tempest eventually lulls - and chromatism rolls into consonance. With starlight chords shining in a shadowy midnight, waves of rounded electronic notes produce tranquil zones for inward contemplation. Throughout the moody flow of its sensory effects Etheric Imprints elicits emotion and appeals to the imagination. Traveling through the vague zones of its four tracks, Roach saves his lyrical moments until the end. In a solo voiced electronic motif, a gently recurring theme brings this album to its most motile point. 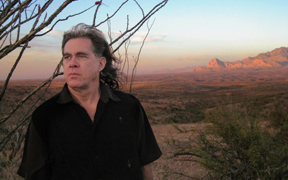 Steve Roach is certainly aware of this music's past, present, and hopes for its future - but in this particular arrangement of sonics he wishes to transmit its expansive promise.